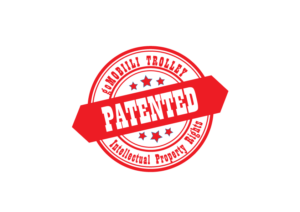 mop/up™ Kiosks are approved by Finnish Food Safety Authority Evira. 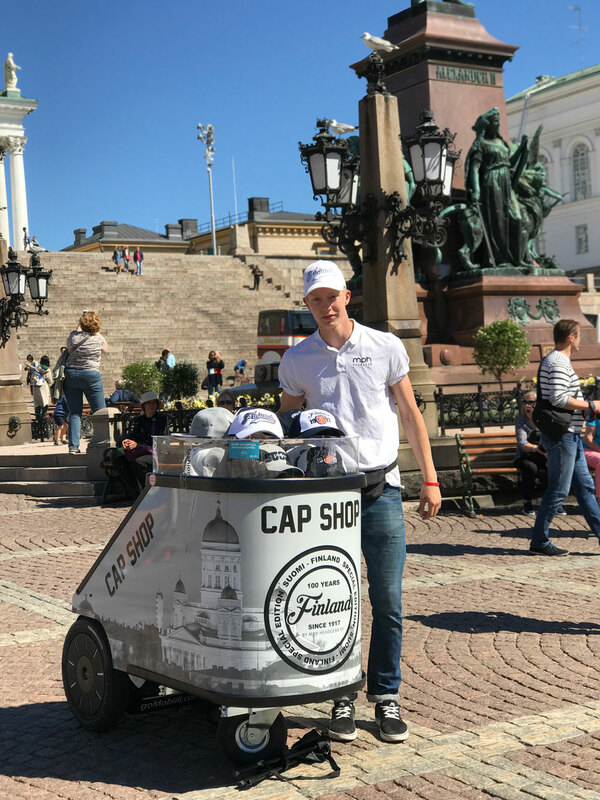 Business idea is to sell high quality baseball caps to tourists in Helsinki city and advertise MPH company. Find customers on the streets and in the parks and events. Segway mop/up5 Trolley goes to tourist spots and parks around Helsinki and sell Baseball Caps with Suomi - Finland logo. The collection includes 8 designs with Finland logo and the capsule is fit for 96 pcs of baseball caps. Consisted of four part time working students. Comments Petri Herpiö, CEO of MPH Headgear Oy Ltd.
>>When I first time saw these mop/up shop in social media, I had my flaslight idea, why not to sell high quality baseball caps with Helsinki and Finland logos/designs to tourists at Helsinki downtown. Next thing I noticed I was dialing number and phoned to Mr. JP Heino the founder of the mop/up trolley concept and ordered 2 pcs of Cap Mobile Shops. The whole thing got so fast that the business planning was left out of existence. We just went to tourist spots and parks and started to sell>>. >>Helsinki’s weather conditions in summer 2017 were unstable. This included many cold rainy days. The working hours were 4-8 hours per day and the minimum target turnover was 400,00€/day. Due to the weather conditions some days the Cap Mobile Shop did not operate at all. The results between 15.6. - 15.8.2017 were promising. Two Cap Mobiles reached turnover 62.000€>>. >>If I deduct all costs, one trolley is 100% paid with in three months>>. For season 2018 MPH company has bought 3.600 pcs of baseball caps for both cap shops, totally 7.200 caps. Season starts 1.6. and ends 31.9.2018. - 4 different designs: 2 Baseball caps and 2 Straight Visor(“Snap back”). - Selling prices will be between 15,00-25,00€ per cap. - Calculated with cheapest cap 15,00€ x 3.600 = 54.000€ per shop. Total turnover target with 2 shops is 108.000€. Sell House Blend Coffee and bread on the streets and in the parks and events. Segway mop/up2 Trolley goes there where peoples are between different locations around Helsinki and sell Roberts Coffee House Blend coffee and bun. Serving capacity 2 x 5,5 L = 54 pcc of 210 mL cups. Sell Nestlé(Froneri) Ice Creams on the streets and in the parks and events. 3 pcs of Segway mop/up1 Trolleys goes there where peoples are between different locations around Helsinki and sell Nestlé ice creams. Serving capacity 100-150 ice creams with each filling. Sell Roberts Coffee House Blend Coffee and bun. Lead people to nearby Roberts Coffee Store. Serving capacity 2 x 5,5 L, 54 pcs of 210 mL coffee cups and 50 pcs of bun. Sell the Mad Croc Energy Drinks, Energy Gums and Energy Jellies. Segway mop/up1 Trolley sell and advertise Mad Croc Energy Drinks, Energy Gums and Energy Jellies. Serving capacity 100 bottles with one filling. 2 pcs of Segway mop/up1 Trolleys sells Moët & Chandon Champagne at Pori Jazz International Music Festival at Pori in Finland. Serving capacity 50 bottles with one filling. Convincing sales figures together with innovative marketing 56 500 visitors. Give a way free of charge ice cream to all visitors and wellcome them to event. Mercedes-Benz introduced new car models and wanted to give visitors more than the traditional coffee and bun. With in 3 hours, totally 900 pcs of Ice Creams was distributed to visitors. Advertise Qatar Airlines new route between Qatar-Helsinki and give a way free cup of Roberts Coffee House Blend coffee. 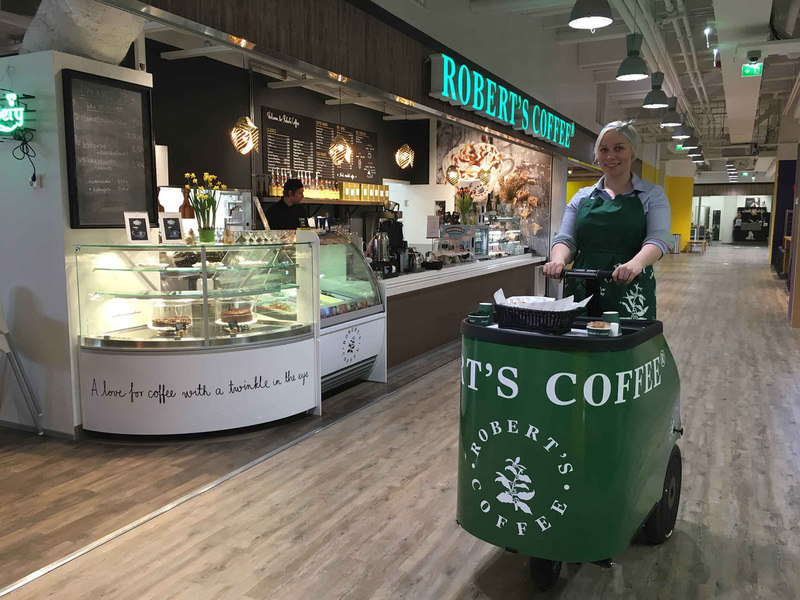 Qatar Airlines Crew used Segway mop/up2 Trolley to promote themselves, giving away free Roberts Coffee House Blend coffee to peoples at Citykäytävä Helsinki, Finland. Same time they introduced their new route and services for coffee takers. With in 4 hours, totally 370 pcs of coffee cups was distributed to visitors. Advertise new Mumin Kaffe, in address Österlånggatan 5, Stockholm(Gamla Stan) and lead people to visit Cafeteria. Give away product samples and discuss with the peoples. Period 24.-26.8.2017 Suomi Finland 100v. event at Kungsträdgården. We organised whole action for customer, our driver Stina Laurell was perfect choice for the driver, because here knowledge and love about Mumi family was touchable. After first day we knew that this mopup kiosk did it´s mission like we expected. All people loved it, they took selfie pictures with it and approached to talk with us. When I do write this, we have done our first day, but we have a work to do 8 hours per day. Do advertising and be as a fair booth table + storage for exhibitors goods etc.as in bonus you can ride at corridor and give a way your cataloques. Trolley used also to deliver catalogues to exhibition visitors outside of expo halls. Trolley worked fine inside the fair at the booth and corridors, outside use was as a bonus. The promotion was organized by MKTG Event Company for their customers Froneri and Apetit. The promotion idea was to launch new WEGE POPS Ice Cream to consumers. 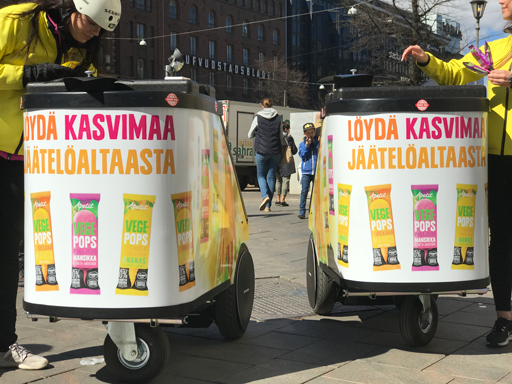 Execution: Giving up and promoting WEGE POPS Ice Creams to people in downtown Helsinki. Resources: 2 pieces of mop/up1 kiosk, 1 piece of freezer car. Staff: 2 mop/up Kiosk drivers, one assistant person at the freezer car to help with the filings and one person filming and taking photos for the social media. Results: Within 6 hours and 30 minutes mop/up Kiosks distributed 7,000 WEGE POPS Ice Creams. Considerations: The weather was cloudy and temperature between 9 and 14 degrees of celsius. People were interested in the new WEGE POPS Ice Creams as they showed interest to the mop/up Kiosks as well. All of our ice cream that we had with us was gone after the promotion.
" I noticed that the mop/up Kiosks received extra attention and they were easy and efficient to work with. With mop/up Kiosks made it was easy to change places even though the downtown area was full of people. It was also nice to notice how much the new WEGE Ice Cream attracted people". - Promo girl Emilia. Brand and Catch, go on the streets and let peoples to see your innovative values. Brand and Catch, mop/up4 Trolley has 2 x 150 liter trash bags and hidden storage bag for trash bags. With this trolley you can go anywhere where you can walk, it is only 67,50 cm wide and 140 cm long. It fits all elevators and you can do your work also in floors. Let peoples to see your innovative values. If you are B2B customer this is for you. 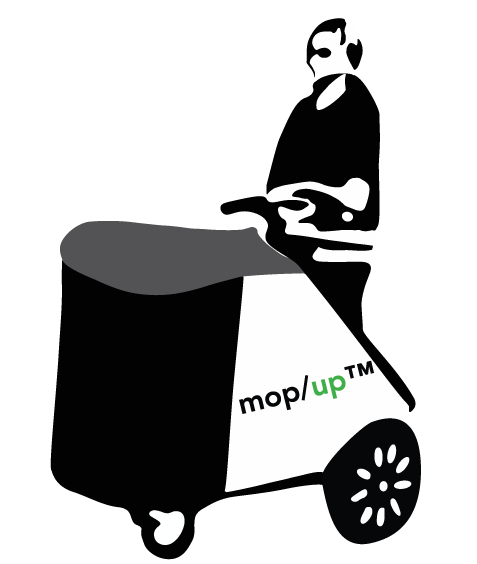 We sell and rent mop/up™ Trolleys. If you are interested then just click the button and let´s start to work with your Out of Home Advertising project. 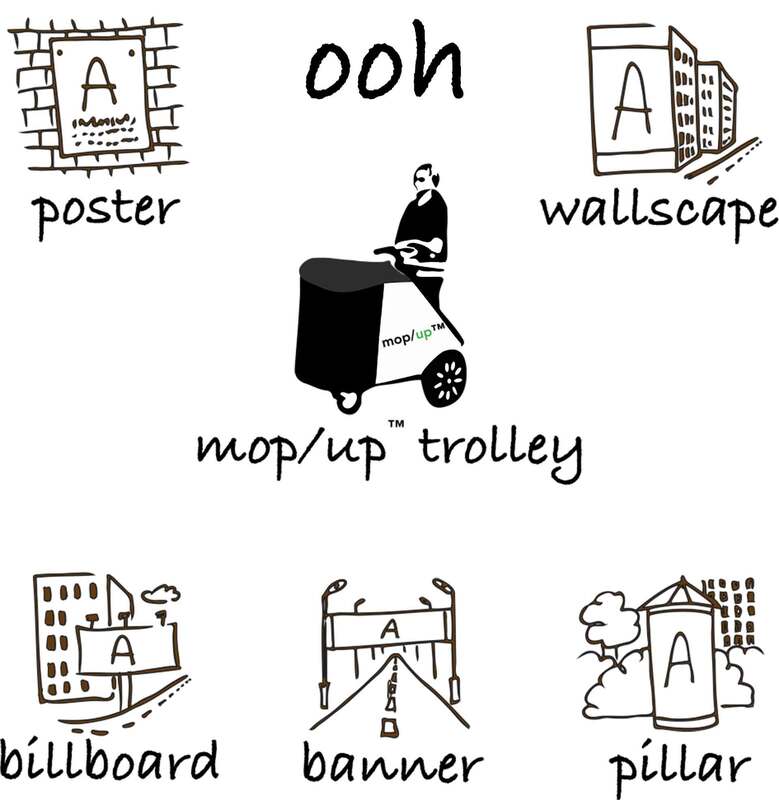 If you are interested to sell mop/up™ Trolleys, this area is for you.